I aim to send out my newsletters twice this month – which if that happens will make a record for me. I usually send it out two times each year which is rather bad and something I want to change. If you’re signed up you might not even know it or remember that you signed up because you never heard from me… Gah! But to give myself some incentive to send it, and for you to sign up (if you’re not already a subscriber) I thought I’d do a giveaway in March. I’ve got three months worth of The Journey Within to give away. It’s a year long art journal and book binding class where I’m one of the teachers. I have two spots to give away to one lucky subscriber! Yay, right? But first, a question for you: If you’ve got a newsletter of your own I’d love to know if you too struggle with sending it out? What do you include, how do you set your schedule etcetera? Let me know in the comments below. Or if you subscribe to a good one, what makes it a keeper? What would you want to know from me, what could I help you with in your life? Please give me some guidance here! Thanks in advance. Just sign up in the form below within this post (or here) and I’ll let you know what to do to be entered into the giveaway at the end of this month. If you’re already a subscriber you don’t need to do anything. I’ll be in touch, I promise! This entry was posted in A Creative Life and tagged crafty business, newsletter. Bookmark the permalink. I only ever clean when I’m procrastinating! My favourite newsletters are from the blogs Shiny Happy World (Wendy Gratz) and While She Naps (Abby Glassenberg). They both have a round up of blog posts – just a brief summary and links, some links to interesting projects and articles they found and a smidge of what real life is up to for them. Oh, In Color Order is also a keeper, but that’s mostly because of George the bunny. So cute! I’ve been putting off starting a blog for years now. I look at hosting options and my brain melts. I think you should write about what is making you happy and share what is going on with you… rather than what you think we want to read/hear. What reason do you have to actually want to send out a newsletter and include that! I love seeing a post from you… I love the colour and the variety and uniqueness of what you do… good luck! I subscribe to a few newsletters from bloggers. I notice that a lot of the time, it’s not a newsletter, per se, but just a reiteration of their most recent blog post….which is totally fine with me, because I sometimes go through the newsletter in my inbox versus just straight there….especially if it’s something beautiful, like this! Eye candy gets me every time! I do check your blog directly. But I have been looking for your newsletter, too! In particular, regarding the Spring DIY Postcard Swap ;) I wouldn’t sweat it…whether you’re blogging or sending a newsletter…I’m all there! 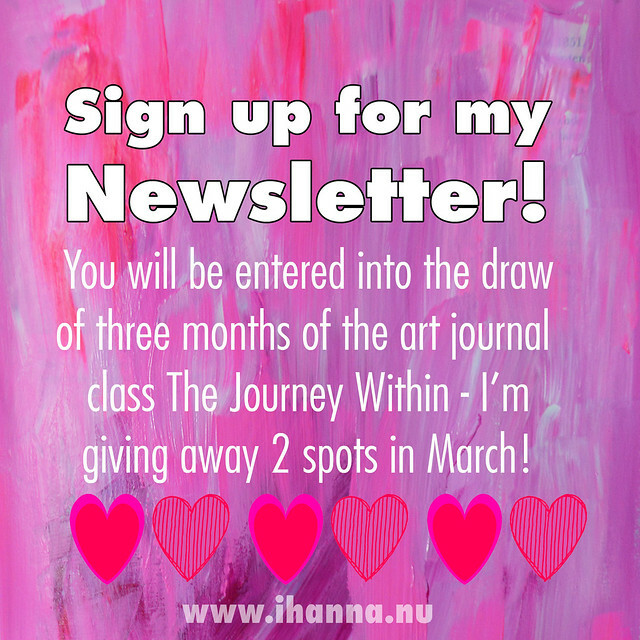 I do a monthly newsletter. I work on it in advance so I’m at least a month ahead in case something comes (life happens) up I’ll at least have a little something to share. It is a general letter, not about me but about arting as a whole & junk. I hope it inspires people to believe in them selves and that in turn blooms into inspiring others. I seldom get feed back so I’m going on the idea that as long as it makes me happy I’ll do it. If one day I stop then I will.